BRE MD Damion Verhoogt (L) in conversation with Jim Chown. Heavy road transport equipment manufacturer Bruce Rock Engineering (BRE) officially opened a new workshop facility in Forrestfield, Perth last month. The new facility will be used for steel cutting and processing of all BRE equipment, and fabrication of the chassis of its Super-Quad road train. 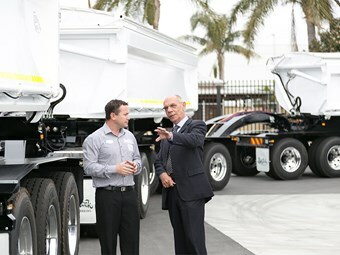 The 60-metre road train, which was on display during the event, aims to reduce heavy vehicle road traffic and also offer cost efficiencies to the mining sector. The event was officiated by WA transport minister’s parliamentary secretary Jim Chown. "Bruce Rock Engineering is a WA-owned and operated manufacturing company with a history dating back to 1980," Chown says. "It is always great to see a West Australian, family owned company grow nationally and continue to keep its manufacturing capabilities in this state. "This new Forrestfield facility is strategically located right in the heart of a transport and logistics hub and on the road train route to the north of this state and to the east coast further strengthening our state’s capability to deliver cost and time efficiently." The new purpose-built facility has been designed and constructed by the BRE team. It spans across one hectare and includes a 2700 square metre workshop and 350 square metres of administration offices. "Today’s launch is a significant milestone for the business cumulating the organisation’s recent expansion into the east coast to extend the company’s capacity to deliver transport equipment to Queensland, New South Wales, Victoria, South Australia and Tasmania," BRE MD Damion Verhoogt says. "The significance of the Forrestfied location means that we are close to our clients and have the ability to provide Perth metropolitan access to repairs, modifications and maintenance."